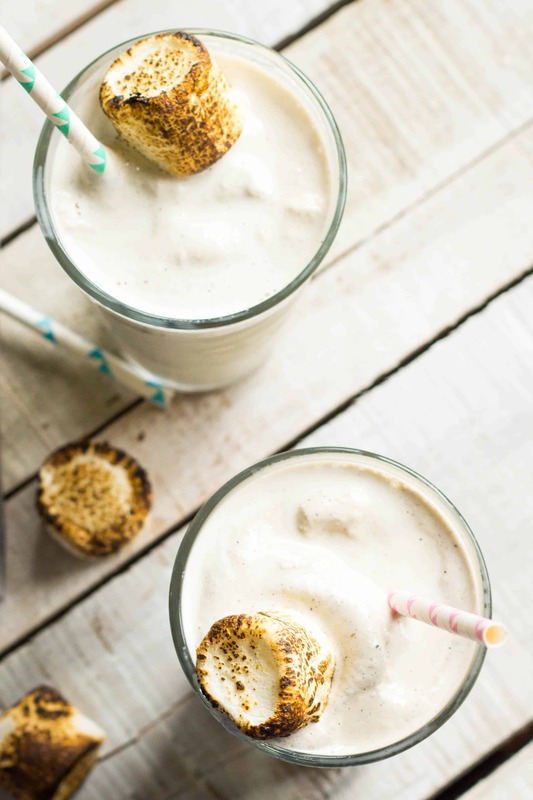 These toasted marshmallow milkshakes are absolutely INSANE! So easy to make but they taste like nothing you’ve ever had before. Sweet, toasty, ice cold perfection! This milkshake is going to bring all the boys – and the girls – to the yard. Is it possible to dream about milkshakes without getting that stupid song stuck in your head? The answer is no. At least for me, anyway. On this rainy Friday morning I am most definitely dreaming about milkshakes. These milkshakes. 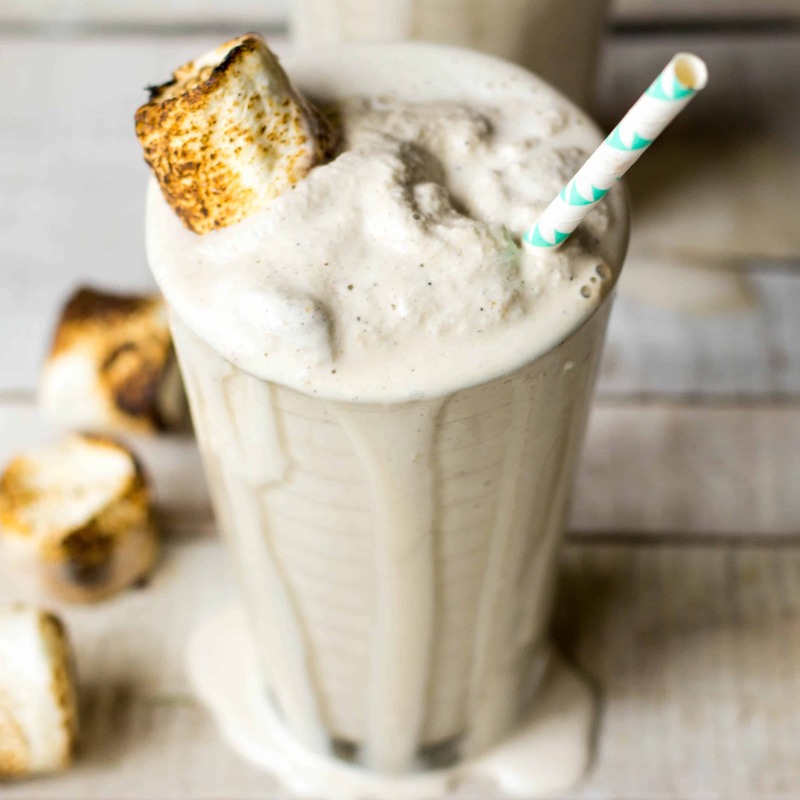 The toasted marshmallow milkshake developed somewhat of a cult following over the past few years when a now-closed burger joint in NYC, called The Stand, started serving them. I don’t live in NYC, so I’ve never tried theirs. But like most NYC cult phenomenons, I heard about them and had to try making one myself. So I did. And it was everything I had hoped it would be, and then some. Such a simple recipe, with only two ingredients – okay, three if you count the salt – but the flavors are mind-bogglingly-delicious. It tastes like camping and childhood and summer. And since next week is spring and summer is soon to follow, I think its high time we all start indulging in more toasted marshmallow milkshakes to commemorate the seasons. You with me? Line a sheet pan with tin foil and place the marshmallows on top. Do not use parchment or it will catch on fire. Use a blow torch to toast 8 of the marshmallows on all sides, being sure to really get them nice and charred. The remaining two marshmallows will be for garnish, so they can be toasted slightly less. If you don’t have a blow torch, you can opt to toast the marshmallows under the broiler instead. Just be sure to spray the tin foil with cooking spray to prevent sticking. Keep an eye on them and remove when they are nice and charred. You can also choose to skewer the marshmallows on a stick and toast them individually over a gas stovetop or fire. Scoop the ice cream into a vessel large enough to fit all the ingredients and still have a little room to move. Add the milk, 8 extra charred marshmallows and a pinch of salt. Use an immersion blender to blend until very smooth. Alternatively, you can do this in a regular blender if you prefer. Pour the milkshake into two tall glasses, garnish with the remaining marshmallows, pop in a straw and sip till your heart’s content. Brought this girl to the yard! I only like burnt marshmallows, too. mmm hmmm.